As of June 30, 2016 (the last business day of the Registrant’s most recently completed second fiscal quarter), the aggregate market value of voting stock held by non-affiliates of the Registrant was approximately $1.4 billion. As of February 16, 2017, there were 26,527,770 shares of the Registrant’s common stock outstanding. Portions of the Registrant’s Proxy Statement for its 2017 Annual Meeting of Shareholders are incorporated by reference to Part III of this Annual Report on Form 10-K.
our ability to protect our intellectual property and not infringe on others’ intellectual property. Certain of these factors and others are described in the discussion on risk factors that appear in Part I, Item 1A. “Risk Factors” of this Annual Report on Form 10-K and uncertainties are detailed in this and other reports and filings with the Securities and Exchange Commission (SEC). Other unknown or unpredictable factors also could have material adverse effects on our future results. We cannot guarantee future results, levels of activity, performance or achievements. Accordingly, you should not place undue reliance on these forward-looking statements. Finally, we expressly disclaim any intent or obligation to update any forward-looking statements to reflect subsequent events or circumstances. Proto Labs, Inc. was incorporated in Minnesota in 1999. The terms “Proto Labs,” the “Company,” “we,” “us,” and “our” as used herein refer to the business and operations of Proto Labs, Inc. and its subsidiaries. We are an e-commerce driven digital manufacturer of quick-turn, on-demand custom parts for prototyping and short-run production. We manufacture parts for product developers and engineers worldwide, who are under increasing pressure to bring their finished products to market faster than their competition. We utilize injection molding, computer numerical control (CNC) machining and 3D printing to manufacture custom parts for our customers. Our proprietary technology eliminates most of the time-consuming and expensive skilled labor conventionally required to quote and manufacture parts. Our customers conduct nearly all of their business with us over the Internet. We target our products to the millions of product developers and engineers who use three-dimensional computer-aided design (3D CAD) software to design products across a diverse range of end-markets. We have established our operations in the United States, Europe and Japan, which we believe are three of the largest geographic markets where these product developers and engineers are located. Additional information required by this item is incorporated herein by reference to Note 17 – Segment Reporting of the Notes to our consolidated financial statements, which appears in Part II, Item 8. of this Annual Report on Form 10-K. We believe our use of advanced technology enables us to offer significant advantages at competitive prices to many product developers and engineers and is the primary reason we have become a leading supplier of custom parts. they need end-of-life production support. In each of these instances, we believe our solution provides product developers and engineers with an exceptional combination of speed, quality, competitive pricing, ease of use and reliability that they typically cannot find among conventional custom parts manufacturers. Our technology enables us to ship parts as soon as the same day after receipt of a customer’s design submission. Our manufacturing product lines currently include Injection Molding, CNC Machining and 3D Printing. We continually seek to expand the range of size and geometric complexity of the parts we can make with these processes, to extend the variety of materials we are able to support and to identify additional manufacturing processes to which we can apply our technology in order to better serve the evolving preferences and needs of product developers and engineers. We have experienced significant growth since our inception in 1999. We have grown our total revenue from $126.0 million in 2012 to $298.1 million in 2016. We have grown our income from operations from $34.9 million in 2012 to $61.8 million in 2016.
rapid overmolding technology which expanded the breadth of our manufacturing capabilities in our Injection Molding product line in 2016. We serve product developers and engineers worldwide who bring new ideas to market in the form of products containing one or more custom parts. Many of these product developers and engineers use 3D CAD software to create digital models representing their custom part designs that are then used to create physical parts for concept modeling, prototyping, functional testing, market evaluation or production. Custom prototype parts play a critical role in the product development process, as they provide product developers and engineers with the ability to test and confirm their intended performance requirements and explore design alternatives. Early in the product development process, 3D printing processes such as stereolithography (SL) can be used to quickly produce an approximate physical representation of a part, but these representations may not meet product developers’ and engineers’ requirements for dimensional accuracy, cosmetics or material properties. As an alternative, 3D printing processes such as selective laser sintering (SLS) and direct metal laser sintering (DMLS) or CNC machining can be used to produce low volumes of high-quality custom parts in either metal or plastic. For follow-on functional testing, market evaluation and production runs, parts are typically manufactured using injection molding. We have developed proprietary software and advanced manufacturing processes that automate much of the skilled labor conventionally required in quoting, production engineering and manufacturing of custom parts. We believe our interactive web-based interface and highly automated processes address the desires of many product developers and engineers for a fast, efficient and cost-effective means to obtain custom parts and are the primary reasons we have become a leading supplier of custom parts. Our digital model is centered on our web-based interface and proprietary software to automate many of the manual and time-consuming processes typically required to obtain custom injection-molded, CNC-machined or 3D-printed parts from conventional suppliers. Our platform automates many aspects of the entire process from design submission through manufacturability analysis and feedback, quotation, order submission, mold design, tool path generation and mold or part manufacture. To utilize our platform, a prospective customer uploads a 3D CAD file of their required part through our website. Often within minutes of design submission, our software analyzes the manufacturability of the part, assesses our ability to make the part, and returns a firm price quotation with any recommendations for design modifications. In the case of CNC machining, this manufacturability analysis identifies features that may be too fragile to be machined and areas that cannot be machined at all. For injection molding, problematic features such as undercuts, thin areas, thick areas and areas requiring geometry adjustments to allow the part to be ejected from the mold are identified. Many of our customers find this analysis particularly helpful, as it diagnoses and prevents potential problems prior to manufacturing. We can also provide a flow analysis to identify parts that may be so thin and large that plastic will solidify before the mold can be completely filled. Our quoting system is highly interactive, enabling our prospective customers to change the material, finish, quantity or shipping schedule of orders, and to instantly receive an updated quotation. Once an order is received, our software automates much of the manual engineering and skilled labor that is normally required to manufacture parts. As a result, in many cases we are able to quote orders in minutes and ship parts as soon as the same day ordered. Our proprietary, highly scalable quoting technology addresses the manual processes conventionally involved in submitting a design, analyzing its manufacturability, making design revision recommendations and generating price quotations. This enables us to quickly analyze high volumes of 3D CAD part design submissions and provide feedback to our prospective product developer and engineer customers. In 2016 alone, we generated quotations for over 650,000 design submissions. Our proprietary manufacturing automation technology is also highly scalable, enabling us to process large numbers of unique designs and, combined with our manufacturing processes, efficiently and effectively manufacture high volumes of parts to meet the needs of product developers and engineers. Our web-based customer interface provides a straightforward means of submitting 3D CAD part designs. Our proprietary manufacturability analysis then quickly analyzes whether a part design falls within our manufacturing capabilities. In many cases, our software provides suggested design modifications to enhance manufacturability, which is presented to the product developer or engineer in an interactive quotation containing a color-coded 3D representation of the part. This allows product developers and engineers to quickly determine the manufacturability of their parts, understand the cost and when they can be shipped. Our interactive quotations provide instant visibility into the impact of changing an order’s various parameters such as material, finish, quantity or shipping schedule. As a result, we provide product developers and engineers with an easy-to-use and consistent means to obtain custom parts. Based on internal market research, we believe we generally have competitive pricing on custom orders. We believe this is a direct result of our technology and the efficiency of our operations, both of which were designed specifically for custom parts production. By limiting these costs, we can typically offer attractive pricing not normally possible in the custom parts market, and as a result, we can typically offer product developers and engineers competitive prices on custom manufactured parts. We have developed a proprietary, intranet-based monitoring and control system that allows us to monitor key aspects of our entire worldwide operations in real time using an easy-to-understand management dashboard. This system provides us with the ability to quickly react to new information across our organization. Our Injection Molding, CNC Machining and 3D Printing product lines offer many product developers and engineers the ability to quickly and efficiently outsource their quick-turn custom parts manufacturing. See Item 7. “Management’s Discussion and Analysis of Financial Condition and Results of Operations” for the historical revenue generated by each of Injection Molding, CNC Machining and 3D Printing. Our Injection Molding product line uses our 3D CAD-to-CNC machining technology for the automated design and manufacture of thermoplastic, metal or liquid silicone injection molds, which are then used to produce custom injection-molded parts on commercially available equipment. Our Injection Molding product line is used for prototype, on-demand and short-run production. Prototype quantities typically range from 25 to 100 parts. Because we retain possession of the molds, customers who need short-run production often come back to Proto Labs’ Injection Molding product line for additional quantities typically ranging up to 10,000 parts or more. They do so to support pilot production for product testing or while their tooling for high-volume production is being prepared, because they need on-demand manufacturing due to disruptions in their manufacturing process, because their product will only be released in a limited quantity or because they need end-of-life production support. These additional part orders typically occur on approximately half of the molds that we make, typically accounting for approximately half of our total Injection Molding revenue. Our CNC Machining product line uses commercially available CNC machines to cut plastic or metal blocks into one or more custom parts based on the 3D CAD model uploaded by the product developer or engineer. Our efficiencies derive from the automation of the programming of these machines and a proprietary fixturing process. The CNC Machining product line is well suited to produce small quantities, typically in the range of one to 200 parts. Our 3D Printing product line includes stereolithography (SL), selective laser sintering (SLS) and direct metal laser sintering (DMLS) processes, which offers customers a wide-variety of high-quality, precision rapid prototyping and low volume production. These processes create parts with a high level of accuracy, detail, strength and durability. 3D Printing is well suited to produce small quantities, typically in the range of one to 50 parts. The process for Injection Molding, CNC Machining and 3D Printing begins when the product developer or engineer uploads one or more 3D CAD models representing the desired part geometry through our website. Our proprietary software uses complex algorithms to analyze the 3D CAD geometry, analyze its manufacturability and support the creation of an interactive, web-based quotation containing pricing and manufacturability information. A link to the quotation is then e-mailed to the product developer or engineer, who can access the quotation, change a variety of order parameters and instantly see the effect on price before finalizing the order. For 3D Printing, the quote is reviewed and then scheduled for production. For CNC Machining, the tool paths are then reviewed and routed to our high-speed CNC machining centers for execution. In the case of Injection Molding, our proprietary software supports the creation of the mold design and the tool paths required to manufacture the mold components, which are then routed to our CNC machining centers for execution. Once the mold is assembled, it is placed in one of our injection molding presses to create the required parts. For our CNC Machining product line, we ship parts as soon as the same day as the order is received. For our Injection Molding and 3D Printing product lines, we ship parts in as little as one business day from design submission. We ship our parts via small parcel common carriers on standard terms and conditions. We plan to expand our customer base to serve more product developers and engineers within the companies that have already used our product lines. Individual product developers and engineers typically make or influence the choice of vendor when sourcing custom parts. We believe a significant opportunity exists for us to leverage highly satisfied product developers and engineers to encourage others within the same organization to utilize our product lines. We have historically generated a significant number of new customers through word-of-mouth referrals from other product developers and engineers, and combine these referrals with the efforts of our marketing and sales force to identify and market our product lines to the colleagues of our existing customers. We also plan to use our marketing and sales capabilities to continue to pursue product developers and engineers within companies who have not yet used our products. Our presence in geographic regions that have high populations of 3D CAD users provides us with a broad universe of potential new customer companies on which to focus our marketing and sales efforts. We believe there may be opportunities to grow by identifying and expanding into select additional geographic markets. We currently operate in the United States, Europe and Japan, where we believe a substantial portion of the world’s product developers and engineers are located. We entered the European market in 2005 and launched operations in Japan in 2009. For 2016, revenue earned in these markets represents approximately 25% of our total revenue. In 2016, we increased marketing efforts in Europe and the surrounding regions. While we currently do not have specific plans to expand into any particular geographic markets, we believe opportunities exist to serve the needs of product developers and engineers in select new geographic regions and we will continue to evaluate such opportunities if and when they arise. We plan to further enhance the functionality and ease of use of our platform and expand the capabilities of our technology in order to further increase automation and meet the evolving needs of product developers and engineers worldwide. We believe product developers and engineers have come to expect advanced web-based tools and a fully integrated Internet platform from their vendors. We will continue to use the Internet to provide product developers and engineers with a standardized interface through which they can upload their 3D CAD models and obtain firm, interactive quotations quickly and efficiently. We seek to identify additional manufacturing processes to which we can apply our digital technology and expertise to meet a greater range of product developers’ and engineers’ needs. Introducing new manufacturing processes can both attract new customers and provide us with a significant opportunity to cross-sell our existing product lines to our existing customer base. We regularly evaluate new manufacturing processes to offer product developers and engineers and introduce such new processes when we are confident that a sufficient market demand exists and that we can offer the same advantages our customers have come to expect from us. See Item 6. “Selected Financial Data” for disclosure of our historical research and development expenses. Examples of new manufacturing processes we have added include CNC Machining, 3D Printing through the acquisitions of FineLine and Alphaform and the launch of liquid silicone rubber injection molding, lathe-turned parts and rapid overmolding technology. Our CNC Machining product line was first introduced in the United States in 2007 and represents 27.3% of our total revenue in the year ended December 31, 2016. In April 2014, we added 3D-printing technologies through our acquisition of FineLine and further expanded our 3D printing capabilities in October 2015 through our acquisition of Alphaform. Our 3D Printing product line represents 12.7% of our total revenue in the year ended December 31, 2016. During 2014, we introduced liquid silicone rubber injection molding and in February 2015, we introduced lathe-turned products to further expand our product offerings. In 2016, we expanded the breadth of our manufacturing capabilities by adding rapid overmolding technology to our Injection Molding product line. Our Injection Molding product line represents 59.0% of our total revenue in the year ended December 31, 2016. We regularly analyze the universe of customer design submissions that we are currently unable to manufacture and focus a portion of our research and development efforts to expand the range of parts that we can produce. Since we first introduced our Injection Molding product line in 1999, we have steadily expanded the size and geometric complexity of the injection-molded parts we are able to manufacture, and we continue to extend the diversity of materials we are able to support. Similarly, since first introducing our CNC Machining product line in 2007, we have expanded the range of part sizes, design geometries and materials we can support. As we continue to expand the range of our existing process capabilities, we believe we will meet the needs of a broader set of product developers and engineers and consequently convert a higher number of quotation requests into orders. Our international marketing effort generates prospects for our sales teams and seeks to strengthen our reputation as an industry leader in digital manufacturing services for custom prototyping and low-volume manufacturing. Since we are an agile, technology-based company, much of our marketing activities occur online. We use marketing automation software to enhance the productivity of our marketing and sales teams and continuously track the results of every campaign to ensure our return on investment. We maintain top-of-mind brand awareness with product developers and engineers through regular publication of technical information including design guidelines and helpful tips, engineering white papers, educational webinars, quick videos, and a quarterly journal focused on important industry topics. We also provide complimentary physical design aids to designers and engineers — as well as teachers and students — that highlight technical aspects of injection molding to help create efficient, well-designed parts. We believe these educational materials are key aspects of our lead generation efforts. Marketing represents the face of Proto Labs, so it is our goal to actively and intelligently engage designers and engineers across multiple mediums — whether print, online, social media or in person. By doing this, we gain new customers, drive sales and build brand equity. We maintain an internal sales team trained in the basics of part design and the capabilities of our manufacturing product lines, as well as the key advantages of our product lines over alternate methods of custom parts manufacturing. We organize our sales team into complementary roles: business development, account management and strategic account management, with the former focused on selling to new customer companies and the latter two focused on expanding sales within existing customer companies. We believe our sales staff is adept at researching customer companies and networking to find additional product developers and engineers who may have a need for our products. We also have a team of customer service engineers who can support highly technical engineering discussions with product developers and engineers as required during the sales process. Our revenue is generated from a diverse customer base, with no single customer company representing more than 2% of our total revenue in 2016. Captive in-house product manufacturing. Many larger companies undertaking product development have established additive rapid prototyping, CNC machining or injection molding capabilities internally to support prototyping or manufacturing requirements of their product developers and engineers. Other custom parts manufacturers. There are thousands of alternative manufacturing machine shops, injection molding suppliers, 3D printing service bureaus and vendors worldwide. The size and scale of these businesses range from very small specialty shops to large, high-volume production manufacturers. Price: mold and part pricing. We believe that we have competitive strengths that position us favorably and have enabled us to become a leader in our markets. We also believe that substantially all of our current direct competitors are relatively small in terms of size of operations, revenue, number of customers and volume of parts sold, and generally lack our technological capabilities. However, our industry is evolving rapidly and other companies, including potentially larger and more established companies with developed technological capabilities, may begin to focus on custom parts manufacturing. These companies could more directly compete with us, along with our existing competitors, and could also launch new products and product lines that we do not offer that may quickly gain market acceptance. Any of the foregoing could adversely affect our ability to attract customers. Our patents have expiration dates ranging from 2022 to 2032. We also owned approximately 12 registered and 1 pending United States trademarks or service marks as of December 31, 2016, with corresponding registered protection in Europe and Japan for the most important of these marks such as PROTO LABS, PROTOMOLD, FIRSTCUT, PROTOQUOTE, FIRSTQUOTE, PROTOFLOW and FINELINE, corresponding approved protection in Canada for PROTO LABS, FIRSTCUT and FINELINE, and corresponding registered protection in Australia, Canada and Mexico for PROTOMOLD. There can be no assurance that the steps we take to protect our proprietary rights will be adequate or that third parties will not infringe or misappropriate such rights. We have been subject to claims and expect to be subject to legal proceedings and claims from time to time in the ordinary course of our business. In particular, we may face claims from third parties that we have infringed their patents, trademarks or other intellectual property rights. Such claims, even if not meritorious, could result in the expenditure of significant financial and managerial resources. Any unauthorized disclosure or use of our intellectual property could make it more expensive to do business and harm our operating results. As of December 31, 2016, we had 1,700 full-time employees. We consider our current relationship with our employees to be good. We also regularly use independent contractors and other temporary employees across the organization to augment our regular staff. We believe that our future success will depend in part on our continued ability to attract, hire and retain qualified personnel. Our principal executive offices are located at 5540 Pioneer Creek Drive, Maple Plain, Minnesota 55359 and our telephone number is (763) 479-3680. Our website address is www.protolabs.com. Information on our website does not constitute part of this Annual Report on Form 10-K or any other report we file or furnish with the SEC. We provide free access to various reports that we file with or furnish to the SEC through our website as soon as reasonably practicable after they have been filed or furnished. These reports include, but are not limited to, our Annual Reports on Form 10-K, Quarterly Reports on Form 10-Q, Current Reports on Form 8-K and any amendments to these reports. Our SEC reports can be accessed through the investor relations section of our website. The public may read and copy any materials that we file with the SEC at the SEC’s Public Reference Room at 100 F Street, N.E., Washington, D.C. 20549. The public may obtain information on the operation of the Public Reference Room by calling the SEC at 1-800-SEC-0330. The SEC maintains a website that contains reports, proxy and information statements, and other information regarding issuers that file information electronically with the SEC. The SEC’s website is www.sec.gov. Executive officers of the Company are elected at the discretion of the board of directors with no fixed terms. There are no family relationships between or among any of the executive officers or directors of the Company. Victoria M. Holt. Ms. Holt has been our President and Chief Executive Officer since February 2014. Prior to joining Proto Labs, Ms. Holt served as President and Chief Executive Officer of Spartech Corporation, a leading producer of plastic sheet, compounds and packaging products, from September 2010 until Spartech was purchased by PolyOne Corporation in March 2013. Ms. Holt also is a member of the Board of Directors of Waste Management, Inc.
Robert Bodor. Dr. Bodor has served as our Vice President/General Manager - Americas since January 2015. From July 2013 to January 2015, Dr. Bodor served as our Chief Technology Officer. From December 2012 to June 2013, Dr. Bodor served as our Director of Business Development. Prior to joining Proto Labs, from January 2011 to December 2012, Dr. Bodor held several roles at Honeywell, most recently leading SaaS business offerings for Honeywell’s Life Safety Division. John A. Way. Mr. Way has served as our Chief Financial Officer and Executive Vice President of Development since December 2014. From October 2013 to September 2014, Mr. Way served as Chief Financial Officer of Univita Health Inc., a privately held home healthcare service provider. From September 2012 to July 2013, Mr. Way served as Chief Financial Officer of Virtual Radiologic, a global telemedicine company. From October 2002 to November 2012, Mr. Way worked in senior financial positions at several divisions within UnitedHealth Group, including Chief Financial Officer of Optum Collaborative Care, SecureHorizons and OptumHealth. Arthur R. Baker III. Dr. Baker has been our Chief Technology Officer since May 2016. Prior to joining Proto Labs, Dr. Baker served as Chief Technology Officer of PaR Systems, a robotics and specialty machine tool builder. From 2005 to 2014, Dr. Baker held multiple positions at MTS Systems, including General Manager of the Test Division, Chief Technology Officer, and Vice President of Engineering and Operations. MTS Systems was a leader in mechanical testing and simulation systems for automotive, aerospace, medical, civil-seismic and general research. David M. Fein. Mr. Fein has been our Chief Revenue Officer since December 2016. Prior to joining Proto Labs, Mr. Fein spent 16 years at PMC-Sierra, Inc., a semiconductor and software solutions provider for big data storage, optical transport networks and wireless infrastructure markets. Most recently, Mr. Fein served as Executive Vice President, Worldwide Sales from December 2014 until PMC-Sierra, Inc. was acquired by Microsemi Corporation in January 2016. From November 2008 to November 2014, Mr. Fein served as Vice President, Sales for the Americas at PMC-Sierra. John B. Tumelty. Mr. Tumelty has served as the Vice President/General Manager and Managing Director – Europe, Middle East and Africa since January 2015. Mr. Tumelty served as the Managing Director of Proto Labs, Limited from its inception in July 2005 to January 2015. Mr. Tumelty leads our company’s operations in Europe. The following are the significant factors that could materially adversely affect our business, financial condition, or operating results, as well as adversely affect the value of an investment in our common stock. We face significant competition and expect to face increasing competition in many aspects of our business, which could cause our operating results to suffer. The market for custom parts manufacturing is fragmented and highly competitive. We compete for customers with a wide variety of custom parts manufacturers and methods. Some of our current and potential competitors include captive in-house product lines, other custom parts manufacturers and alternative manufacturing vendors such as those utilizing 3D printing processes including stereolithography (SL), selective laser sintering (SLS) and direct metal laser sintering (DMLS). Moreover, some of our existing and potential competitors are researching, designing, developing and marketing other types of products and product lines. We also expect that future competition may arise from the development of allied or related techniques for custom parts manufacturing that are not encompassed by our patents, from the issuance of patents to other companies that may inhibit our ability to develop certain products and from improvements to existing technologies. Furthermore, our competitors may attempt to adopt and improve upon key aspects of our business model, such as development of technology that automates much of the manual labor conventionally required to quote and manufacture custom parts, implementation of interactive web-based and automated user interface and quoting systems and/or building scalable operating models specifically designed for efficient custom production. Third-party CAD software companies may develop software that mold-makers, injection molders and CNC machine shops could use to compete with our business model. Additive manufacturers may develop stronger, higher temperature resins or introduce other improvements that could more effectively compete with us on part quality. We may also, from time to time, establish alliances or relationships with other competitors or potential competitors. To the extent companies terminate such relationships and establish alliances and relationships with our competitors, our business could be harmed. Existing and potential competitors may have substantially greater financial, technical, marketing and sales, manufacturing, distribution and other resources and name recognition than us, as well as experience and expertise in intellectual property rights and operating within certain international locations, any of which may enable them to compete effectively against us. Though we plan to continue to expend resources to develop new technologies, processes and product lines, we cannot assure you that we will be able to maintain our current position or continue to compete successfully against current and future sources of competition. Our challenge in developing new products is finding product lines for which our automated quotation and manufacturing processes offer an attractive value proposition, and we may not be able to find any new product lines with potential economies of scale similar to our molding and machining product lines. If we do not keep pace with technological change and introduce new technologies, processes and product lines, the demand for our products and product lines may decline and our operating results may suffer. Our success depends on our ability to deliver products and product lines that meet the needs of product developers and engineers and to effectively respond to changes in our industry. We derive almost all of our revenue from the manufacture and sale to product developers and engineers of quick-turn low volumes of custom parts for prototyping, support of internal manufacturing and limited quantity product release. Our business has been, and, we believe, will continue to be, affected by changes in product developer and engineering requirements and preferences, rapid technological change, new product and product line introductions and the emergence of new standards and practices, any of which could render our technology, products and product lines less attractive, uneconomical or obsolete. To the extent that our customers’ need for quick-turn parts decreases significantly for any reason, it would likely have a material adverse effect on our business and operating results and harm our competitive position. In addition, CAD simulation and other technologies may reduce the demand for physical prototype parts. Therefore, we believe that to remain competitive, we must continually expend resources to enhance and improve our technology, product offerings and product lines. In particular, we plan to increase our research and development efforts and to continue to focus a significant portion of those efforts to further develop our technology in areas such as our interactive user interface and manufacturing processes, potentially introduce new manufacturing processes within the research and development initiative we refer to as Protoworks, and broaden the range of parts that we are able to manufacture. We believe successful execution of this part of our business plan is critical for our ability to compete in our industry and grow our business, and there are no guarantees we will be able to do so in a timely fashion, or at all. Broadening the range of parts we offer is of particular importance since limitations in manufacturability are the primary reason we are not able to fulfill many quotation requests. There are no guarantees that the resources devoted to executing on this aspect of our business plan will improve our business and operating results or result in increased demand for our products and product lines. Failures in this area could adversely impact our operating results and harm our reputation and brand. Even if we are successful in executing in these areas, our industry is subject to rapid and significant technological change, and our competitors may develop new technologies, processes and product lines that are superior to ours. Our research and development costs were approximately $22.4 million, $18.4 million and $16.6 million for the years ended December 31, 2016, 2015 and 2014, respectively, and there is no guarantee that these costs will enable us to maintain or grow our revenue profitability. Refer to Item 7. “Management’s Discussion and Analysis of Financial Condition and Results of Operations” in this Annual Report on Form 10-K for additional discussion related to research and development costs. Any failure to properly meet the needs of product developers and engineers or respond to changes in our industry on a cost-effective and timely basis, or at all, would likely have a material adverse effect on our business and operating results and harm our competitive position. Our failure to meet our product developers’ and engineers’ expectations regarding quick turnaround time would adversely affect our business and results of operations. We believe many product developers and engineers are facing increased pressure from global competitors to be first to market with their finished products, often resulting in a need for quick turnaround of custom parts. We believe our ability to quickly quote, manufacture and ship custom parts has been an important factor in our results to date. There are no guarantees we will be able to meet product developers’ and engineers’ increasing expectations regarding quick turnaround time, especially as we increase the scope of our operations. If we fail to meet our customers’ expectations regarding turnaround time in any given period, our business and results of operations will likely suffer. Our failure to meet our product developers’ and engineers’ price expectations would adversely affect our business and results of operations. Demand for our product lines is sensitive to price. We believe our competitive pricing has been an important factor in our results to date. Therefore, changes in our pricing strategies can have a significant impact on our business and ability to generate revenue. Many factors, including our production and personnel costs and our competitors’ pricing and marketing strategies, can significantly impact our pricing strategies. If we fail to meet our customers’ price expectations in any given period, demand for our products and product lines could be negatively impacted and our business and results of operations could suffer. Our failure to meet our product developers’ and engineers’ quality specifications would adversely affect our business and results of operations. We believe many product developers and engineers have a need for specific quality of quick-turn, on-demand custom parts. We believe our ability to create parts with the specifications of the product developers and engineers is an important factor in our results to date. If we fail to meet our customers’ specifications in any given period, demand for our products and product lines could be negatively impacted and our business and results of operations could suffer. The strength of our brand is important to our business, and any failure to maintain and enhance our brand would hurt our ability to retain and expand our customer base as well as further penetrate existing customers. Since our products and product lines are sold primarily through our websites, the success of our business depends upon our ability to attract new and repeat customers to our websites in order to increase business and grow our revenue. Customer awareness and the perceived value of our brand will depend largely on the success of our marketing efforts, as well as our ability to consistently provide quality custom parts within the required timeframes and positive customer experiences, which we may not do successfully. A primary component of our business strategy is the continued promotion and strengthening of our brand, and we have incurred and plan to continue to incur substantial expense related to advertising and other marketing efforts directed toward enhancing our brand. We have initiated marketing efforts through social media, but this method of marketing may not be successful and subjects us to a greater risk of inconsistent messaging and bad publicity. We may choose to increase our branding expense materially, but we cannot be sure that this investment will be profitable. If we are unable to successfully maintain and enhance our brand, this could have a negative impact on our business and ability to generate revenue. Our business depends in part on our ability to process a large volume of new part designs from a diverse group of product developers and engineers and successfully identify significant opportunities for our business based on those submissions. We believe the volume of new part designs we process and the size and diversity of our customer base give us valuable insight into the needs of our prospective customers. We utilize this industry knowledge to determine where we should focus our development resources. If the number of new part designs we process or the size and diversity of our customer base decrease, our ability to successfully identify significant opportunities for our business and meet the needs of product developers and engineers could be negatively impacted. In addition, even if we do continue to process a large number of new part designs and work with a significant and diverse customer base, there are no guarantees that any industry knowledge we extract from those interactions will be successfully utilized to help us identify significant business opportunities or better understand the needs of product developers and engineers. The loss of one or more key members of our management team or personnel, or our failure to attract, integrate and retain additional personnel in the future, could harm our business and negatively affect our ability to successfully grow our business. We are highly dependent upon the continued service and performance of the key members of our management team and other personnel. The loss of any of these individuals, each of whom is “at will” and may terminate his or her employment relationship with us at any time, could disrupt our operations and significantly delay or prevent the achievement of our business objectives. We believe that our future success will also depend in part on our continued ability to identify, hire, train and motivate qualified personnel. A possible shortage of qualified individuals in the regions where we operate might require us to pay increased compensation to attract and retain key employees, thereby increasing our costs. In addition, we face intense competition for qualified individuals from numerous companies, many of whom have substantially greater financial and other resources and name recognition than us. We may be unable to attract and retain suitably qualified individuals who are capable of meeting our growing operational, managerial and other requirements, or we may be required to pay increased compensation in order to do so. Our failure to attract, hire, integrate and retain qualified personnel could impair our ability to achieve our business objectives. If we fail to grow our business as anticipated, our net sales, gross margin and operating margin will be adversely affected. We are attempting to grow our business substantially. To this end, we have made and expect to continue to make significant investments in our business, including investments in our infrastructure, technology, and marketing and sales efforts. These investments include dedicated facilities expansion and increased staffing, both domestic and international. If our business does not generate the level of revenue required to support our investment, our net sales and profitability will be adversely affected. If we are unable to manage our growth and expand our operations successfully, our reputation and brand may be damaged, and our business and results of operations may be harmed. These enhancements and improvements will require significant capital expenditures and allocation of valuable management and employee resources. Furthermore, our growth, combined with the geographical dispersion of our operations, has placed, and will continue to place, a strain on our operational, financial and management infrastructure. Our future financial performance and our ability to execute on our business plan will depend, in part, on our ability to effectively manage any future growth and expansion. There are no guarantees we will be able to do so in an efficient or timely manner, or at all. Our failure to effectively manage growth and expansion could have a material adverse effect on our business, results of operations, financial condition, prospects, and reputation and brand, including impairing our ability to perform to our customers’ expectations. We may not timely and effectively scale and adapt our existing technology, processes and infrastructure to meet the needs of our business. A key element to our continued growth is the ability to quickly and efficiently quote an increasing number of product developer and engineer submissions across geographic regions and to manufacture the related parts. This will require us to timely and effectively scale and adapt our existing technology, processes and infrastructure to meet the needs of our business. With respect to our websites and quoting technology, it may become increasingly difficult to maintain and improve their performance, especially during periods of heavy usage and as our solutions become more complex and our user traffic increases across geographic regions. Similarly, our manufacturing automation technology may not enable us to process the large numbers of unique designs and efficiently manufacture the related parts in a timely fashion to meet the needs of product developers and engineers as our business continues to grow. Any failure in our ability to timely and effectively scale and adapt our existing technology, processes and infrastructure could negatively impact our ability to retain existing customers and attract new customers, damage our reputation and brand, result in lost revenue, and otherwise substantially harm our business and results of operations. Numerous factors may cause us not to maintain the revenue growth that we have historically experienced. react to challenges from existing and new competitors. We cannot assure you that we will be successful in addressing the factors above and continuing to grow our business and revenue. Our operating results and financial condition may fluctuate on a quarterly and annual basis. Our operating results and financial condition may fluctuate from quarter to quarter and year to year, and are likely to continue to vary due to a number of factors, some of which are outside of our control. In addition, our actual or projected operating results may fail to match our past performance. These events could in turn cause the market price of our common stock to fluctuate. If our operating results do not meet the expectations of securities analysts or investors, who may derive their expectations by extrapolating data from recent historical operating results, the market price of our common stock will likely decline. plant shutdowns due to a health pandemic or weather conditions. Due to all of the foregoing factors and the other risks discussed in this “Risk Factors” section, you should not rely on quarter-to-quarter or year-to-year comparisons of our operating results as an indicator of future performance. Interruptions to or other problems with our website and interactive user interface, information technology systems, manufacturing processes or other operations could damage our reputation and brand and substantially harm our business and results of operations. The satisfactory performance, reliability, consistency, security and availability of our websites and interactive user interface, information technology systems, manufacturing processes and other operations are critical to our reputation and brand, and to our ability to effectively service product developers and engineers. Any interruptions or other problems that cause any of our websites, interactive user interface or information technology systems to malfunction or be unavailable, or negatively impact our manufacturing processes or other operations, may damage our reputation and brand, result in lost revenue, cause us to incur significant costs seeking to remedy the problem and otherwise substantially harm our business and results of operations. A number of factors or events could cause such interruptions or problems, including among others: human and software errors, design faults, challenges associated with upgrades, changes or new facets of our business, power loss, telecommunication failures, fire, flood, extreme weather, political instability, acts of terrorism, war, break-ins and security breaches, contract disputes, labor strikes and other workforce-related issues, capacity constraints due to an unusually large number of product developers and engineers accessing our websites or ordering parts at the same time, and other similar events. These risks are augmented by the fact that our customers come to us largely for our quick-turn manufacturing capabilities and that accessibility and turnaround speed are often of critical importance to these product developers and engineers. We are dependent upon our facilities through which we satisfy all of our production demands and in which we house all of the computer hardware necessary to operate our websites and systems as well as managerial, customer service, sales, marketing and other similar functions, and we have not identified alternatives to these facilities or established fully redundant systems in multiple locations. However, we have back-up computing systems for each of our United States, European and Japanese operations. In addition, we are dependent in part on third parties for the implementation and maintenance of certain aspects of our communications and production systems, and therefore preventing, identifying and rectifying problems with these aspects of our systems is to a large extent outside of our control. Moreover, the business interruption insurance that we carry may not be sufficient to compensate us for the potentially significant losses, including the potential harm to the future growth of our business that may result from interruptions in our product lines as a result of system failures. We depend on the continued growth of product developers’ and engineers’ e-commerce expectations when working with their custom parts manufacturers and their migration from 2D to 3D CAD software. The business of selling custom parts over the Internet via an interactive web-based and automated user interface and quoting system is not widespread in our industry. Moreover, many product developers and engineers still utilize 2D CAD software. Concerns about privacy and technological and other problems may discourage some product developers and engineers from adopting the Internet as the medium for procuring their custom parts or adopting 3D CAD software, particularly in countries where e-commerce and 3D CAD software are not as prevalent as they are in our current markets or with product developers and engineers in industries not well suited to utilize our product lines, such as architecture. In order to expand our customer base, we must appeal to and procure customers who historically have used more traditional means of commerce and/or 2D CAD drawings to purchase their customer parts. If product developers and engineers are not sufficiently attracted to the value proposition of or satisfied with our web-based interface and quotation system, or product developers and engineers do not continue to migrate to 3D CAD software as we currently anticipate, our business could be adversely impacted. The success of our product lines will depend largely on the development and maintenance of the Internet infrastructure. This includes maintenance of a reliable network backbone with the necessary speed, data capacity, and security, as well as timely development of complementary products, for providing reliable Internet access and services. The Internet has experienced, and is likely to continue to experience, significant growth in the numbers of users and amount of traffic. The Internet infrastructure may be unable to support such demands. In addition, increasing numbers of users, increasing bandwidth requirements, or problems caused by “viruses,” “worms,” malware and similar programs may harm the performance of the Internet. The Internet has experienced a variety of outages and other delays as a result of damage to portions of its infrastructure, and it could face outages and delays in the future. These outages and delays could reduce the level of Internet usage generally as well as the level of usage of our product lines, which could adversely impact our business. If the security of our customers’ confidential information stored in our systems is breached or otherwise subjected to unauthorized access, our reputation or brand may be harmed, and we may be exposed to liability. Our system stores, processes and transmits our customers’ confidential information, including the intellectual property in their part designs, credit card information and other sensitive data. We rely on encryption, authentication and other technologies licensed from third parties, as well as administrative and physical safeguards, to secure such confidential information. Any compromise of our information security could damage our reputation and brand and expose us to a risk of loss, costly litigation and liability that would substantially harm our business and operating results. We may not have adequately assessed the internal and external risks posed to the security of our company’s systems and information and may not have implemented adequate preventative safeguards or take adequate reactionary measures in the event of a security incident. In addition, most states have enacted laws requiring companies to notify individuals and often state authorities of data security breaches involving their personal data. These mandatory disclosures regarding a security breach often lead to widespread negative publicity, which may cause our existing and prospective customers to lose confidence in the effectiveness of our data security measures. Any security breach, whether successful or not, would harm our reputation and brand and could cause the loss of customers. Global economic conditions may harm our ability to do business, increase our costs and negatively affect our stock price. The prospects for economic growth in the United States and other countries remain uncertain and could worsen. Economic concerns and other issues such as reduced access to capital for businesses may cause product developers and engineers to further delay or reduce the product development projects that our business supports. Given the continued uncertainty concerning the global economy, we face risks that may arise from financial difficulties experienced by our suppliers, product developers and engineers and other related risks to our business. Political and economic uncertainty arising from the outcome of the United Kingdom’s recent referendum on its membership in the European Union could adversely affect our business and results of operations. On June 23, 2016, the United Kingdom (UK) held a referendum in which voters approved a withdrawal from the European Union (EU), commonly referred to as “Brexit.” The outcome of the Brexit vote triggered short-term financial volatility, including a decline in the value of the British Pound in comparison to both the United States dollar and the Euro. The impact of the Brexit referendum and the ongoing uncertainty associated with the outcome thereof may result in various long-term financial consequences for businesses operating in the UK, the EU and beyond. As a result of the referendum, it is expected that the British government will begin negotiating the terms of the UK’s relationship with the EU going forward, including the terms of trade between the UK and the EU. Although the specific terms and the timeframe in which they will be negotiated are unknown, it is possible that these changes could adversely affect our business and results of operations. We operate a global business that exposes us to additional risks. increased payment risk and higher levels of payment fraud. Our business depends on product developers’ and engineers’ demand for our product lines, the general economic health of current and prospective customers, and companies’ desire or ability to make investments in new products. A deterioration of global, regional or local political, economic or social conditions could affect potential customers in ways that reduce demand for our product lines, disrupt our manufacturing and sales plans and efforts or otherwise negatively impact our business. Acts of terrorism, wars, public health issues and increased energy costs could disrupt commerce in ways that could impair our ability to get products to our customers and increase our manufacturing and delivery costs. We have not undertaken hedging transactions to cover our foreign currency exposure, and changes in foreign currency exchange rates may negatively impact reported revenue and expenses. In addition, our sales are often made on unsecured credit terms, and a deterioration of political, economic or social conditions in a given country or region could reduce or eliminate our ability to collect accounts receivable in that country or region. In any of these events, our results of operations could be materially and adversely affected. If a natural or man-made disaster strikes any of our manufacturing facilities, we will be unable to manufacture our products for a substantial amount of time and our sales will decline. We manufacture all of our products in 9 manufacturing facilities, located in Maple Plain, Minnesota; Rosemount, Minnesota; Plymouth, Minnesota; Raleigh, North Carolina; Telford, United Kingdom; Feldkirchen, Germany; Eschenlohe, Germany; Rusko, Finland and Zama, Kanagawa, Japan. These facilities and the manufacturing equipment we use would be costly to replace and could require substantial lead time to repair or replace. Our facilities may be harmed by natural or man-made disasters, including, without limitation, earthquakes, floods, tornadoes, fires, hurricanes, tsunamis and nuclear disasters. lose customers and be unable to regain those customers. Although we possess insurance for damage to our property and the disruption of our business from casualties, this insurance may not be sufficient to cover all of our potential losses and may not continue to be available to us on acceptable terms, or at all. If our present single or limited source suppliers become unavailable or inadequate, our customer relationships, results of operations and financial condition may be adversely affected. We acquire substantially all of the manufacturing equipment and certain of our materials that are critical to the ongoing operation and future growth of our business from just a few third parties. We do not have long-term supply contracts with any of our suppliers and operate on a purchase-order basis. While most manufacturing equipment and materials for our products are available from multiple suppliers, certain of those items are only available from single or limited sources. Should any of our present single or limited source suppliers for manufacturing equipment or materials become unavailable or inadequate, or impose terms unacceptable to us such as increased pricing terms, we could be required to spend a significant amount of time and expense to develop alternate sources of supply, and we may not be successful in doing so on terms acceptable to us, or at all. Natural disasters, such as hurricanes, may affect our supply of materials, particularly resins, from time to time, and we may purchase larger amounts of certain materials in anticipation of future shortages or increases in pricing. In addition, if we were unable to find a suitable supplier for a particular type of manufacturing equipment or material, we could be required to modify our existing business processes and offerings to accommodate the situation. As a result, the loss of a single or limited source supplier could adversely affect our relationship with our customers and our results of operations and financial condition. We may not be able to adequately protect or enforce our intellectual property rights, which could impair our competitive position. Our success and future revenue growth will depend, in part, on our ability to protect our intellectual property. We rely primarily on patents, licenses, trademarks and trade secrets, as well as non-disclosure agreements and other methods, to protect our proprietary technologies and processes globally. Despite our efforts to protect our proprietary technologies and processes, it is possible that competitors or other unauthorized third parties may obtain, copy, use or disclose our technologies and processes. We cannot assure you that any of our existing or future patents will not be challenged, invalidated or circumvented. As such, any rights granted under these patents may not provide us with meaningful protection. We may not be able to obtain foreign patents corresponding to our United States patents. Even if foreign patents are granted, effective enforcement in foreign countries may not be available. If our patents and other intellectual property do not adequately protect our technology, our competitors may be able to offer product lines similar to ours. Our competitors may also be able to develop similar technology independently or design around our patents. Any of the foregoing events would lead to increased competition and lower revenue or gross margin, which would adversely affect our net income. We may be subject to infringement claims. We may be subject to intellectual property infringement claims from individuals, vendors and other companies who have acquired or developed patents in the fields of CNC machining, injection molding or part production for purposes of developing competing products or for the sole purpose of asserting claims against us. Any claims that our products or processes infringe the intellectual property rights of others, regardless of the merit or resolution of such claims, could cause us to incur significant costs in responding to, defending and resolving such claims, and may prohibit or otherwise impair our ability to commercialize new or existing products. If we are unable to effectively defend our processes, our market share, sales and profitability could be adversely impacted. Our failure to expand our intellectual property portfolio could adversely affect the growth of our business and results of operations. Expansion of our intellectual property portfolio is one of the available methods of growing our revenue and our profits. This involves a complex and costly set of activities with uncertain outcomes. Our ability to obtain patents and other intellectual property can be adversely affected by insufficient inventiveness of our employees, by changes in intellectual property laws, treaties, and regulations, and by judicial and administrative interpretations of those laws, treaties and regulations. Our ability to expand our intellectual property portfolio could also be adversely affected by the lack of valuable intellectual property for sale or license at affordable prices. There is no assurance that we will be able to obtain valuable intellectual property in the jurisdictions where we and our competitors operate or that we will be able to use or license that intellectual property. We may be subject to product liability claims, which could result in material expense, diversion of management time and attention and damage to our business and reputation and brand. The prototype parts we manufacture and the parts we manufacture in low volumes may contain undetected defects or errors that are not discovered until after the products have been installed and used by customers. This could result in claims from customers or others, damage to our business and reputation and brand, or significant costs to correct the defect or error. We attempt to include provisions in our agreements with customers that are designed to limit our exposure to potential liability for damages arising from defects or errors in our products. However, it is possible that these limitations may not be effective as a result of unfavorable judicial decisions or laws enacted in the future. The sale and support of our products entails the risk of product liability claims. Any product liability claim brought against us, regardless of its merit, could result in material expense, diversion of management time and attention, damage to our business and reputation and brand, and cause us to fail to retain existing customers or to fail to attract new customers. We are subject to general business regulations and laws as well as regulations and laws specifically governing the Internet and e-commerce. Existing and future laws and regulations may impede the growth of the Internet or other online services. These regulations and laws may cover taxation, restrictions on imports and exports, customs, tariffs, user privacy, data protection, pricing, content, copyrights, distribution, electronic contracts and other communications, consumer protection, the provision of online payment services, broadband residential Internet access and the characteristics and quality of products and product lines. It is not clear how existing laws governing issues such as property use and ownership, sales and other taxes, fraud, libel and personal privacy apply to the Internet and e-commerce, especially where these laws were adopted prior to the advent of the Internet and do not contemplate or address the unique issues raised by the Internet or e-commerce. Those laws that do reference the Internet are being interpreted by the courts and their applicability and reach are therefore uncertain. The costs of compliance with these regulations may increase in the future as a result of changes in the regulations or the interpretation of them. Further, any failures on our part to comply with these regulations may subject us to significant liabilities. Those current and future laws and regulations or unfavorable resolution of these issues may substantially harm our business and results of operations. We are a multinational company based in the United States and subject to tax in multiple tax jurisdictions, both domestic and abroad. Our future effective tax rates could be adversely affected by changes in statutory tax rates or interpretation of tax rules and regulations in jurisdictions in which we do business, changes in the amount of revenue or earnings in the countries with varying statutory tax rates, or by changes in the valuation of deferred tax assets and liabilities. In addition, we are subject to audits and examinations of previously filed income tax returns by the Internal Revenue Service, or IRS, and other domestic and foreign tax authorities. We regularly assess the potential impact of such examinations to determine the adequacy of our provision for income taxes and have reserved for potential adjustments that may result from the current examinations. We believe such estimates to be reasonable; however, there is no assurance that the final determination of any examination will not have an adverse effect on our operating results and financial position. We intend to continue to make investments to support our business growth and may require additional funds to respond to business challenges, including the need to complement our growth strategy, increase market share in our current markets or expand into other markets, or broaden our technology, intellectual property or product line capabilities. Accordingly, we may need to engage in equity or debt financings to secure additional funds. If we raise additional funds through future issuances of equity or convertible debt securities, our existing shareholders could suffer significant dilution, and any new equity securities we issue could have rights, preferences and privileges superior to those of holders of our common stock. Any debt financing we secure in the future could involve restrictive covenants relating to our capital raising activities and other financial and operational matters, which may make it more difficult for us to obtain additional capital and to pursue business opportunities, including potential acquisitions. We may not be able to obtain additional financing on terms favorable to us, if at all. If we are unable to obtain adequate financing or financing on terms satisfactory to us when we require it, our ability to continue to support our business growth and to respond to business challenges could be significantly impaired, and our business may be harmed. Any acquisition, strategic relationship, joint venture or investment could disrupt our business and harm our operating results and financial condition. requirements to record substantial charges and amortization expense related to certain purchased intangible assets, deferred stock compensation and other items, as well as other charges or expenses. Any one of these challenges or risks could impair our ability to realize any benefit from our acquisitions, strategic relationships, joint ventures or investments after we have expended resources on them, as well as divert our management’s attention. Any failure to successfully address these challenges or risks could disrupt our business and harm our operating results and financial condition. Moreover, any such transaction may not be viewed favorably by investors or stakeholders. In addition, from time to time we may enter into negotiations for acquisitions, relationships, joint ventures or investments that are not ultimately consummated. These negotiations could result in significant diversion of management time, as well as substantial out-of-pocket costs. We depend in part on licenses of technologies from third parties in order to deliver our solutions, and, as a result, our business is dependent in part on the availability of such licenses on commercially reasonable terms. We currently, and will continue to, license certain technologies from third parties. While these licenses are not material to our financial results, their function in our business is integral to our operations. We cannot be certain that these third-party content licenses will be available to us on commercially reasonable terms or that we will be able to successfully integrate the technology into our solutions. These third-party licenses may expose us to increased risk, including risks associated with the assimilation of new technology sufficient to offset associated acquisition and maintenance costs. The inability to obtain any of these licenses could result in delays in solution development until equivalent technology can be identified and integrated. Any such delays in services could cause our business, operating results and financial condition to suffer. Our business involves the use of hazardous materials, and we and our suppliers must comply with environmental laws and regulations, which can be expensive and restrict how we do business. Our business involves the controlled storage, use and disposal of hazardous materials. We and our suppliers are subject to federal, state and local as well as foreign laws and regulations governing the use, manufacture, storage, handling and disposal of these hazardous materials. Although we believe that the safety procedures utilized by us and our suppliers for handling and disposing of these materials comply with the standards prescribed by these laws and regulations, we cannot eliminate the risk of accidental contamination or injury from these materials. In the event of an accident, state, federal or foreign authorities may curtail the use of these materials and interrupt our business operations. We do not currently maintain hazardous materials insurance coverage. If we are subject to any liability as a result of activities involving hazardous materials, our business and financial condition may be adversely affected and our reputation and brand may be harmed. If we are unable to meet regulatory quality standards applicable to our manufacturing and quality processes for the parts we manufacture, our business, financial condition or operating results could be harmed. As a manufacturer of CNC-machined and injection-molded custom parts, we are required to meet certain regulatory standards, including International Organization for Standardization, or ISO, 9001:2008 for our manufacturing facilities in Minnesota. In North Carolina, we are required to meet ISO 9001:2008 standards for our plastics manufacturing and AS9100 standards for our metals manufacturing. We are also able to meet regulatory standards ISO 9001:2008 at our manufacturing facilities in Feldkirchen, Germany, Eschenlohe, Germany and Rusko, Finland. We also meet regulatory standard ISO 13485 at our manufacturing facility in Eschenlohe, Germany. If any regulatory inspection reveals that we are not in compliance with applicable standards, regulators may take action against us, including issuing a warning letter, imposing fines on us, requiring a recall of the parts we manufactured or closing our manufacturing facilities. If any of these actions were to occur, it could harm our reputation as well as our business, financial condition and operating results. In addition, we may need to obtain additional certifications in the future and there are no guarantees we would be able to do so on a timely basis, if at all. Moreover, obtaining and maintaining required regulatory certifications can be costly and divert management’s attention. We accept payments using a variety of methods, including credit card, customer invoicing, physical bank check and payment upon delivery. As we offer new payment options to our customers, we may be subject to additional regulations, compliance requirements and fraud risk. For certain payment methods, including credit and debit cards, we pay interchange and other fees, which may increase over time and raise our operating costs and lower profitability. We rely on third parties to provide payment processing services, including the processing of credit cards, debit cards or electronic checks, and it could disrupt our business if these companies become unwilling or unable to provide these services to us. We are also subject to payment card association operating rules, certification requirements and rules governing electronic funds transfers, which could change or be reinterpreted to make it difficult or impossible for us to comply. If we fail to comply with these rules or requirements, we may be subject to fines and higher transaction fees and lose our ability to accept credit and debit card payments from our customers, process electronic funds transfers, or facilitate other types of online payments, and our business and operating results could be adversely affected. other events or factors, including those resulting from war, acts of terrorism, natural disasters or responses to these events. In addition, the stock markets have experienced extreme price and volume fluctuations that have affected and continue to affect the market prices of equity securities of many companies. In the past, shareholders have instituted securities class action litigation following periods of market volatility. If we were to become involved in securities litigation, we could incur substantial costs and our resources and the attention of management could be diverted from our business. If securities or industry analysts publish inaccurate or unfavorable research or reports about our business, our stock price and trading volume could decline. The trading market for our common stock depends, in part, on the research and reports that securities or industry analysts publish about us or our business. We do not have any control over these analysts. If one or more of the analysts who covers us downgrades our common stock, changes their opinion of our shares or publishes inaccurate or unfavorable research about our business, our stock price would likely decline. If one or more of these analysts ceases coverage of us or fails to publish reports on us regularly, demand for our common stock could decrease and we could lose visibility in the financial markets, which could cause our stock price and trading volume to decline. Our failure to maintain proper and effective internal controls over financial reporting and otherwise comply with Section 404 of the Sarbanes-Oxley Act or prevent or detect misstatements in our financial statements in the future could harm our business and cause a decrease in our stock price. Ensuring that we have internal financial and accounting controls and procedures adequate to produce accurate financial statements on a timely basis is a costly and time-consuming effort that needs to be re-evaluated frequently. The Sarbanes-Oxley Act requires, among other things, that we maintain effective internal control over financial reporting and disclosure controls and procedures. In particular, we are required to perform annual system and process evaluation and testing of our internal control over financial reporting to allow management and our independent registered public accounting firm to report on the effectiveness of our internal control over financial reporting, as required by Section 404 of the Sarbanes-Oxley Act. If we are not able to comply with the requirements of Section 404 in the future, or if we fail to prevent or detect misstatements in the financial statements we include in our reports filed with the SEC, our business could be harmed and the market price of our common stock could decline. Anti-takeover provisions in our charter documents and Minnesota law might discourage or delay acquisition attempts for us that you might consider favorable. We are subject to the provisions of Section 302A.673 of the Minnesota Statutes, which regulates business combinations. Section 302A.673 generally prohibits any business combination by an issuing public corporation, or any of its subsidiaries, with an interested shareholder, which means any shareholder that purchases 10% or more of the corporation’s voting shares within four years following the date the person became an interested shareholder, unless the business combination is approved by a committee composed solely of one or more disinterested members of the corporation’s board of directors before the date the person became an interested shareholder. These anti-takeover provisions could discourage, delay or prevent a transaction involving a change in control of our company, even if doing so would benefit our shareholders. These provisions could also discourage proxy contests and make it more difficult for you and other shareholders to elect directors of your choosing and to cause us to take other corporate actions you desire. We have never declared or paid any cash dividends on our common stock, and we do not anticipate that we will pay any such cash dividends for the foreseeable future. We anticipate that we will retain all of our future earnings for use in the business and for general corporate purposes. Any determination to pay dividends in the future will be at the discretion of our board of directors and will depend upon results of operations, financial condition, contractual restrictions, restrictions imposed by applicable law and other factors our board of directors deems relevant. Our corporate headquarters are located in Maple Plain, Minnesota in a facility we own encompassing approximately 95,000 square feet of office space. We also own a nearby facility encompassing approximately 35,000 square feet of manufacturing space. We lease an additional facility on a property adjacent to our headquarters that encompasses approximately 40,000 square feet of manufacturing space. The lease for this facility expires in 2017. We own a facility in Rosemount, Minnesota that encompasses approximately 130,000 square feet of manufacturing and office space. We also own a facility in Plymouth, Minnesota that encompasses approximately 170,000 square feet of manufacturing and office space. In April 2014, we purchased FineLine Prototyping, Inc. (FineLine) and assumed the leases of two facilities in Raleigh, North Carolina. The two facilities we lease are approximately 10,000 square feet each. We also purchased a facility in Cary, North Carolina in 2015 that encompasses approximately 77,000 square feet of manufacturing and office space. In 2016, we moved into the new facility in Cary, North Carolina and consolidated operations. As a result, we exited the lease for one of the Raleigh facilities and plan to exit the lease for the other Raleigh facility in 2017. Our European operations are headquartered in Telford, United Kingdom in a facility we own encompassing approximately 126,000 square feet of office and manufacturing space. We also lease office space in Mosbach, Germany, Le Bourget du Lac, France and Novara, Italy, for sales, customer service and technical support staff. The leases expire at various times from 2017 to 2023. In October 2015, we purchased certain assets, including shares of select subsidiaries, of Alphaform AG (Alphaform), headquartered in Feldkirchen (Munich), Germany. As a result of the acquisition, we lease manufacturing and office facilities encompassing approximately 60,000 square feet in Feldkirchen, Germany, approximately 16,000 square feet in Eschenlohe, Germany and approximately 24,000 square feet in Rusko, Finland. The leases expire at various times from 2018 to 2022. Our Japan operations are headquartered in Zama, Kanagawa, Japan (southwest of Tokyo). In 2016, we moved into a new leased facility encompassing approximately 96,000 square feet of office and manufacturing space. The lease expires in April 2023. From time to time, we are subject to various legal proceedings and claims that arise in the ordinary course of our business activities. Although the results of litigation and claims cannot be predicted with certainty, as of the date of this Annual Report on Form 10-K, we do not believe we are party to any litigation the outcome of which, if determined adversely to us, would individually or in the aggregate be reasonably expected to have a material adverse effect on our business. On February 16, 2017, the last reported sale price of our common stock on the NYSE was $55.65 per share. As of February 16, 2017, we had 13 holders of record of our common stock. The actual number of shareholders is greater than this number of record holders, and includes shareholders who are beneficial owners, but whose shares are held in street name by brokers and other nominees. We have never declared or paid any cash dividends on our capital stock. We currently intend to retain all available funds and any future earnings to support our operations and finance the growth and development of our business. We do not intend to pay cash dividends on our common stock for the foreseeable future. Any future determination related to our dividend policy will be made at the discretion of our board of directors and will depend on then-existing conditions, including our financial condition, operating results, contractual restrictions, capital requirements, business prospects and other factors our board of directors may deem relevant. Includes the 2000 Stock Option Plan, the 2012 Long-Term Incentive Plan and our Employee Stock Purchase Plan. Includes 1,285,314 shares remaining available for issuance as of December 31, 2016 under our Employee Stock Purchase Plan. The following graph shows a comparison from February 24, 2012 (the date our common stock commenced trading on the NYSE) through December 31, 2016 of the cumulative total return for our common stock, the S&P 500 Index and the Russell 2000 Index. We have selected the Russell 2000 Index because the Russell 2000 Index measures the performance of the small market capitalization segment of U.S. equity instruments and we are a member company included in the Russell 2000 Index. Such returns are based on historical results and are not intended to suggest future performance. Data for the S&P 500 Index and the Russell 2000 Index assume reinvestment of dividends. We did not sell any unregistered equity securities or purchase any of our securities during the year ended December 31, 2016. On February 9, 2017, we announced that our board of directors had authorized the repurchase of shares of our common stock from time to time on the open market or in privately negotiated purchases, at an aggregate purchase price of up to $50 million. The timing and amount of any share repurchases will be determined by our management based on market conditions and other factors. The term of the program runs through December 31, 2021. The following tables set forth selected consolidated financial data for the periods and at the dates indicated. The selected consolidated statements of comprehensive income data for the years ended December 31, 2016, 2015 and 2014 and selected consolidated balance sheets data as of December 31, 2016 and 2015 are derived from our audited consolidated financial statements included in Item 8. “Financial Statements and Supplementary Data” of this Annual Report on Form 10-K. The selected consolidated statements of comprehensive income data for the years ended December 31, 2013 and 2012 and selected consolidated balance sheet data as of December 31, 2014, 2013 and 2012 are derived from our audited consolidated financial statements not included in this report. The historical results presented below are not necessarily indicative of the results to be expected for any future period. You should read this selected consolidated financial data in conjunction with Item 7. “Management’s Discussion and Analysis of Financial Condition and Results of Operations,” and the consolidated financial statements and related notes appearing in Item 8. “Financial Statements and Supplementary Data” of this Annual Report on Form 10-K.
See Note 3 of Notes to Consolidated Financial Statements for an explanation of the method used to calculate net income per basic and diluted share attributable to common shareholders and weighted average shares outstanding for the years ended December 31, 2016, 2015 and 2014, respectively. The following discussion and analysis of our financial condition and results of operations should be read in conjunction with the consolidated financial statements and related notes included elsewhere in this Annual Report on Form 10-K. This discussion and analysis contains forward-looking statements that involve risks and uncertainties. Our actual results may differ materially from those anticipated in these forward- looking statements as a result of various factors, including those set forth under “Risk Factors” and elsewhere in this Annual Report on Form 10-K.
We are an e-commerce driven digital manufacturer of quick-turn, on-demand injection-molded, CNC-machined, and 3D printed custom parts for prototyping and short-run production. We provide “Real Parts, Really Fast” to product developers and engineers worldwide, who are under increasing pressure to bring their finished products to market faster than their competition. We believe custom parts manufacturing has historically been an underserved market due to the inefficiencies inherent in the quotation, equipment set-up and non-recurring engineering processes required to produce custom parts. Our proprietary technology eliminates most of the time-consuming and expensive skilled labor conventionally required to quote and manufacture parts in low volumes, and our customers conduct nearly all of their business with us over the Internet. We target our product lines to the millions of product developers and engineers who use 3D CAD software to design products across a diverse range of end-markets. Our primary manufacturing product lines currently include Injection Molding, CNC Machining and 3D Printing. We have experienced significant growth since our inception. Since we first introduced our Injection Molding product line in 1999, we have steadily expanded the size and geometric complexity of the injection-molded parts we are able to manufacture, and we continue to extend the diversity of materials we are able to support. Similarly, since first introducing our CNC Machining product line in 2007, we have expanded the range of part sizes, design geometries and materials we can support. In 2014, we acquired FineLine Prototyping, Inc. (FineLine) to expand the number of process types we offer to include stereolithography (SL), selective laser sintering (SLS) and direct metal laser sintering (DMLS). We also continually seek to enhance other aspects of our technology and manufacturing processes, including our interactive web-based and automated user interface and quoting system. We intend to continue to invest significantly to enhance our technology and manufacturing processes and expand the range of our existing capabilities with the aim of meeting the needs of a broader set of product developers and engineers. 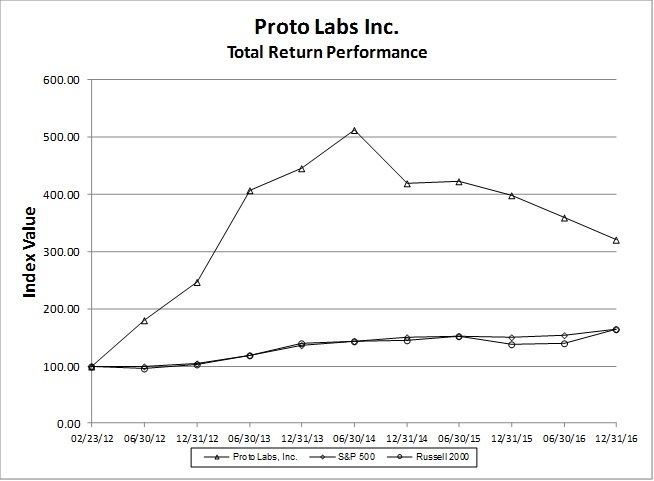 As a result of the factors described above, many of our customers tend to return to Proto Labs to meet their ongoing needs, with approximately 67%, 85% and 87% of our revenue in 2016, 2015 and 2014, respectively, derived from existing customers. We have established our operations in the United States, Europe and Japan, which we believe are three of the largest geographic markets where product developers and engineers are located. We entered the European market in 2005, launched operations in Japan in late 2009 and further expanded into Europe through our acquisition of Alphaform in 2015. As of December 31, 2016, we had sold products into approximately 60 countries. Our revenue outside of the United States accounted for approximately 25%, 27% and 26% of our consolidated revenue in the years ended December 31, 2016, 2015 and 2014, respectively. We intend to continue to expand our international sales efforts and believe opportunities exist to serve the needs of product developers and engineers in select new geographic regions. We have grown our total revenue from $126.0 million in 2012 to $298.1 million in 2016. During this period, our operating expenses increased from $41.2 million in 2012 to $105.2 million in 2016. We have grown our income from operations from $34.9 million in 2012 to $61.8 million in 2016. Our recent growth in revenue and income from operations has been accompanied by increased cost of revenues and operating expenses. We expect to increasingly invest in our operations to support anticipated future growth as discussed more fully below. Our operations are comprised of three geographic operating segments in the United States, Europe and Japan. Revenue is derived from our Injection Molding, CNC Machining and 3D Printing product lines. Injection Molding revenue consists of sales of custom injection molds and injection-molded parts. CNC Machining revenue consists of sales of CNC-machined custom parts. 3D Printing revenue consists of sales of 3D-printed parts. Our revenue is generated from a diverse customer base, with no single customer company representing more than 2% of our total revenue in 2016. Our historical and current efforts to increase revenue have been directed at gaining new customers and selling to our existing customer base by increasing marketing and selling activities, offering additional product lines such as the introduction of our CNC Machining product line in 2007 and 3D Printing through our acquisition of FineLine in 2014, expanding internationally such as the opening of our Japanese office in 2009 and through our acquisition of Alphaform in October 2015, improving the usability of our product lines such as our web-centric applications, and expanding the breadth and scope of our products by adding more sizes and materials to our offerings. During 2016, we served 31,457 unique product developers and engineers, an increase of 15.5% over the same period in 2015. Of those product developers and engineers served in 2016, 16,149 were existing product developers and engineers who had ordered from us in the past, an increase of 20% over the comparable period in 2015, and 15,308 were new product developers and engineers who ordered from us for the first time in 2016, an increase of 12% over the comparable period in 2015. During 2015, we served 27,235 unique product developers and engineers, an increase of 26% over the same period in 2014. Of those product developers and engineers served in 2015, 13,504 were existing product developers and engineers who had ordered from us in the past, an increase of 37% over the comparable period in 2014, and 13,731 were new product developers and engineers who ordered from us for the first time in 2015, an increase of 17% over the comparable period in 2014. During 2014, we served 21,552 unique product developers and engineers, an increase of 34% over the same period in 2013. Of those product developers and engineers served in 2014, 9,839 were existing product developers and engineers who had ordered from us in the past, an increase of 26% over the comparable period in 2013, and 11,713 were new product developers and engineers who ordered from us for the first time in 2014, an increase of 41% over the comparable period in 2013. We experienced strong growth in the number of unique product developers and engineers served in 2014, partially as a result of our acquisition of FineLine in April 2014. Our business model requires that we invest in our capacity well in advance of demand to ensure we can fulfill the expectations for quick delivery of our products to our customers. Therefore, during each of 2016, 2015 and 2014 we made significant investments in additional factory space and infrastructure in the United States. We also made significant investments in additional factory space in Japan in 2016. We expect to continue to grow in future periods, which will result in the need for additional investments in factory space and equipment. We expect that these additional costs for factory and equipment expansion can be absorbed by revenue growth, and allow gross margins to remain relatively consistent over time. We define gross profit as our revenue less our cost of revenue, and we define gross margin as gross profit expressed as a percentage of revenue. Our gross profit and gross margin are affected by many factors, including our pricing, sales volume and manufacturing costs, the costs associated with increasing production capacity, the mix between domestic and foreign revenue sources and foreign exchange rates. Our recent growth in operating expenses is mainly due to higher headcounts to support our growth and expansion, and we expect that trend to continue. Our business strategy is to continue to be a leading online and technology-enabled manufacturer of quick-turn, on-demand injection-molded, CNC-machined, CNC-turned and 3D printed custom parts for prototyping and low-volume production. In order to achieve our goals, we anticipate continued substantial investments in technology and personnel, resulting in increased operating expenses. Research and development. Research and development expense consists primarily of employee compensation, benefits, stock-based compensation, depreciation on equipment and other related overhead. All of our research and development costs have been expensed as incurred. We expect research and development expense to increase in the future as we seek to enhance and expand our product line offerings. Our revenue increased $34.0 million, or 12.9%, for 2016 compared with 2015. By reportable segment, revenue in the United States increased $15.9 million, or 7.6%, for 2016 compared with 2015. Revenue in Europe increased $15.9 million, or 33.6%, for 2016 compared with 2015, partially driven by the acquisition of Alphaform in the fourth quarter of 2015. Revenue in Japan increased $2.1 million, or 24.3%, for 2016 compared with 2015. Our revenue growth in 2016 was the result of increased volume of the product developers and engineers we served. During 2016, we served 31,457 unique product developers and engineers, an increase of 15.5% over 2015. Average revenue per product developer or engineer decreased 6% during 2016 as compared to 2015. Our revenue increases were primarily driven by increases in sales personnel and marketing activities. Our sales personnel focus on gaining new customer accounts and expanding the depth and breadth into existing customer accounts. Our marketing personnel focus on marketing activities that have proven to result in the greatest number of customer leads to support sales activity. International revenue decreased by $1.3 million in 2016 compared to 2015 as a result of foreign currency movements, primarily the strengthening of the United States dollar relative to the British pound. By product line, our revenue growth was driven by a 7.7% increase in Injection Molding revenue, a 9.5% increase in CNC Machining revenue and a 50.6% increase in 3D Printing revenue, in each case for 2016 compared with 2015, as well as a $1.6 million increase in Other Product revenue through our acquisition of Alphaform. During the second quarter, we made the decision to discontinue offering two manufacturing processes within our Injection Molding product lines, Metal Injection Molding (MIM) and Magnesium Thixomolding (Thixo). In addition, in the second quarter, we decided to exit our non-core resin resale business, which was acquired from Alphaform in October 2015. Revenue from resin resale was included in Other Product revenue in 2015 and 2016. MIM, Thixo and resin resale in aggregate represented approximately 1.6% of revenue during 2016. Cost of Revenue. Cost of revenue increased $21.4 million, or 19.5%, for 2016 compared to 2015, which was greater than the rate of revenue increase of 12.9% for 2016 compared to 2015. The increase in cost of revenue resulted from the growth of the business, including via the Alphaform acquisition. Additional increase in the cost of revenue was due to raw material and production cost increases of $5.9 million to support increased sales volumes, an increase in direct labor headcount resulting in personnel and related cost increases of $10.4 million and equipment and facility-related cost increases of $5.1 million. Equipment and facility-related cost increases included $0.6 million of accelerated depreciation of leasehold assets resulting from our move to new facilities in the U.S. and Japan in the third quarter of 2016. Gross Profit and Gross Margin. Gross profit increased from $154.4 million in 2015 to $166.9 million in 2016 primarily due to increasing revenue growth as noted above. Gross margin decreased from 58.5% of revenue in 2015 to 56.0% of revenue in 2016 primarily as a result of lower margins from the acquired Alphaform business, as well as increases in investments of additional manufacturing capacity, accelerated depreciation of leasehold assets and the impact of fluctuations in foreign currency exchange rates. Income from operations decreased $5.4 million, or 8.0%, for 2016 compared with 2015. By reportable segment, income from operations for the United States and Corporate Unallocated and Japan increased 3.3% and 20.2%, respectively, as a percentage of revenue for 2016 compared with 2015. Income from operations for Europe decreased 12.4% as a percentage of revenue for 2016 compared with 2015. Marketing and Sales. Marketing and sales expense increased $6.9 million, or 17.7%, for 2016 compared to 2015 due to an increase in headcount resulting in personnel and related cost increases of $6.2 million and marketing program cost increases of $0.7 million. The increase in marketing program costs is the result of our focus and concentration on funding those programs that have proven to be the most effective in growing our business. Research and Development. Our research and development expense increased $4.0 million, or 22.0%, for 2016 compared to 2015 due to an increase in headcount resulting in personnel and related cost increases of $3.1 million, operating cost increases of $0.8 million and professional services cost increases of $0.1 million. General and Administrative. Our general and administrative expense increased $6.9 million, or 23.3%, for 2016 compared to 2015 due to an increase in headcount resulting in personnel and related cost increases of $2.2 million, facility and administrative cost increases of $3.6 million, professional service cost increases of $0.6 million for outside legal and accounting services, and stock-based compensation cost increases of $0.5 million. The increase in administrative costs for 2016 includes accelerated depreciation and facilities-related charges of $0.8 million resulting from our move to new facilities in the U.S. and Japan in the third quarter of 2016. Other Income, Net. We recognized other income, net of $2.5 million in 2016, an increase of $1.8 million compared to other income, net of $0.7 million for 2015. Other income, net included $1.4 million in foreign currency exchange gains for 2016 compared to $0.5 million in foreign currency exchange losses in 2015. The increase was primarily due to the amount of foreign-currency denominated cash balances abroad and movements in underlying exchange rates at the end of the period. Provision for Income Taxes. Our income tax provision increased $0.2 million for 2016 compared to 2015 due to an increase of taxable income. Our effective tax rate increased to 33.4% in 2016 from 31.5% in 2015 due primarily to the mix of revenue earned in domestic and foreign tax jurisdictions and deductions for which we qualify in the current year. Our revenue increased $54.5 million, or 26.0%, for 2015 compared with 2014, driven primarily by an increase in the product developers and engineers we served. By reportable segment, revenue in the United States increased $42.9 million, or 26.0%, for 2015 compared with 2014. Revenue in Europe increased $9.9 million, or 26.5%, for 2015 compared with 2014. Revenue in Japan increased $1.7 million, or 24.1%, for 2015 compared with 2014. Our revenue growth in 2015 was the result of increased volume of the product developers and engineers we served. During 2015, we served 27,235 unique product developers and engineers, an increase of 26% over 2014. Average revenue per product developer or engineer remained consistent during 2015 as compared to 2014. Our revenue increases were primarily driven by increases in sales personnel and marketing activities. Our sales personnel focus on gaining new customer accounts and expanding the depth and breadth into existing customer accounts. Our marketing personnel focus on marketing activities that have proven to result in the greatest number of customer leads to support sales activity. International revenue decreased by $7.5 million in 2015 compared to 2014 due to strengthening of the United States dollar relative to the British Pound and Japanese Yen, as well as the strengthening of the British Pound relative to the Euro. The effect of pricing changes on international revenue was immaterial for 2015 compared to 2014. By product line, our revenue growth was driven by a 16.5% increase in Injection Molding revenue and a 24.1% increase in CNC Machining revenue, in each case for 2015 compared with 2014, as well as $15.7 million increase in revenue from 3D Printing and $1.2 million in Other Product revenue through our acquisition of Alphaform. Cost of Revenue. Cost of revenue increased $28.5 million, or 35.1%, for 2015 compared to 2014, which was greater than the rate of revenue increase of 26.0% for 2015 compared to 2014. The increase in cost of revenue was due to raw material and production cost increases of $10.8 million to support increased sales volumes, equipment and facility-related cost increases of $3.1 million and an increase in direct labor headcount resulting in personnel and related cost increases of $14.6 million. Gross Profit and Gross Margin. Gross profit increased from $128.4 million in 2014 to $154.4 million in 2015 primarily due to increasing revenue growth as noted above. Gross margin decreased from 61.3% of revenue in 2014 to 58.5% of revenue in 2015 primarily as a result of our 3D Printing product line having a lower gross margin than our CNC Machining and Injection Molding product lines, revenue earned through our acquisition of Alphaform having lower gross margins than our legacy operations, the cost of increased capacity, which has not been fully leveraged, and the impact of fluctuations in foreign currency exchange rates. Income from operations increased $6.6 million, or 10.9%, for 2015 compared with 2014. By reportable segment, income from operations for the United States increased 16.1% as a percentage of revenue for 2015 compared with 2014. Income from operations for Europe and Corporate Unallocated and Japan decreased 9.7% and 13.8%, respectively, as a percentage of revenue for 2015 compared with 2014. Marketing and Sales. Marketing and sales expense increased $10.0 million, or 34.5%, for 2015 compared to 2014 due to an increase in headcount resulting in personnel and related cost increases of $8.2 million and marketing program cost increases of $1.8 million. The increase in marketing program costs is the result of our focus and concentration on funding those programs which have proven to be the most effective in growing our business. Research and Development. Our research and development expense increased $1.7 million, or 10.5%, for 2015 compared to 2014 due to an increase in headcount resulting in personnel and related cost increases of $3.4 million and other operating cost increases of $0.2 million, which were partially offset by decreases in professional service costs of $1.9 million. General and Administrative. Our general and administrative expense increased $7.6 million, or 34.3%, for 2015 compared to 2014 due to an increase in headcount resulting in personnel and related cost increases of $4.4 million, facility and administrative cost increases of $1.5 million, professional service cost increases of $0.7 million for outside legal and accounting services, stock-based compensation cost increases of $0.8 million and intangible amortization expenses of $0.2 million. Other Income (Expense), Net. Other income, net increased $0.7 million for 2015 compared with 2014 due to $0.3 million gain on the bargain purchase of Alphaform, $0.2 million increase in interest income and $0.2 million in other non-operating activity. Provision for Income Taxes. Our income tax provision increased $2.4 million for 2015 compared to 2014 due to an increase of taxable income. Our effective tax rate increased marginally to 31.5% in 2015 from 31.2% in 2014 due primarily to the mix of revenue earned in domestic and foreign tax jurisdictions and deductions for which we qualify in the current year. The following tables set forth selected unaudited quarterly results of operations data for 2016 and 2015. This unaudited quarterly information has been prepared on the same basis as our annual audited consolidated financial statements appearing elsewhere in this Annual Report on Form 10-K and includes all adjustments, consisting only of normal recurring adjustments, that we consider necessary to present fairly the financial information for the fiscal quarters presented. The quarterly data should be read in conjunction with our selected financial data and consolidated financial statements and the related notes appearing elsewhere in this Annual Report on Form 10-K. Operating results for any quarter are not necessarily indicative of results for a full-year period, and the historical results presented below are not necessarily indicative of the results to be expected in any future period.